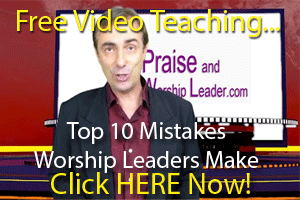 Free Special- How to WOW Your Congregation when you Lead Worship ? Most worship leaders do, you know. And this is not about trying to make ourselves look or feel good, we want to connect our people with the Lord in worship in such a way that they are just blown away. The last thing any worship leader wants is to just go through the motions every Sunday, week after week.! 1 Learning how to WOW your congregation is not about learning secret tips or techniques. Great ideas and cool techniques can help, but to truly WOW your audience, you need to offer something far deeper than gimmicks or tricks. The ability you have to lead people into the presence of God is going to be dependent on your own relationship with the Lord. SO this podcast looks at both of these areas... we look at some great techniques that really can inspire and draw people into the presence of God, but we also talk about how to wow your congregation but offering them a genuine chance to connect to and worship the Lord in Spirit and in truth. So at the start is this New Year, make a commitment to further your skills in worship leading, to deepen your relationship with the Lord and to step out and try something new that really wows your congregation. This is a God-given, God-inspired desire for all worship leaders, not to make yourself the best so everyone loves and worships you, not to sell your latest CD and not to form a fan club within your church. You can desire to wow people because by doing so you can change lives and you can connect your people with the Lord on a deeper level. And in the end, the best way you can WOW your congregation is to give them an awesome encounter with the living God! So sit back, listen to this week's podcast and be inspired and blessed as you start the New Year. Let's make this the greatest year ever in your worship leading ministry!